Frictionless data flow across your supply chain. Fully-integrated EDI processing with unmatched flexibility in connecting with back-office systems. Automate the exchange of EDI to and from multiple trading partners in a scalable and secure way. Support for mapping and translation between EDIFACT, X12, IDoc (SAP), & XML. 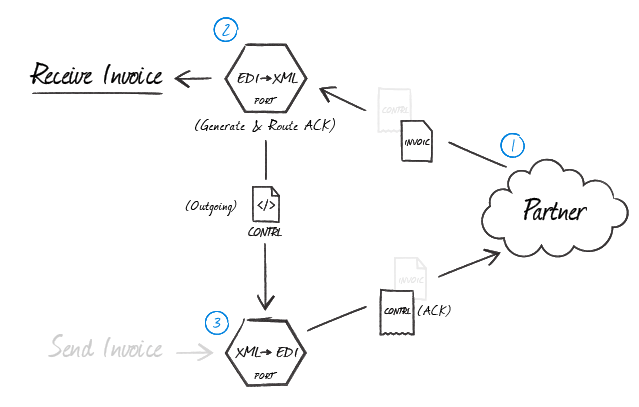 Close the loop between receipt and processing of EDI messages. Powerful data template support enables users to automate the creation of Invoices, Sales Receipts, Purchase Orders, etc. through standard interfaces like Excel, HTML, and Text. Use only what you need. The flexible architecture and licensing of RSSBus Connect allows users to pick and choose the capabilities that matter most. Use RSSBus Connect for Managed File Transfer, or for EDI Integration, or both! Today's B2B and A2A integration challenges require organizations to work with a diverse set of connectivity protocols and messaging formats. RSSBus Connect gives users the tools to tackle B2B messaging, head-on. In addition to powerful secure managed file transfer capabilities, RSSBus Connect includes a host of easy-to-use EDI and B2B messaging features. With a highly flexible and extensible architecture RSSBus Connect allows you to quickly overcome any B2B messaging challenges. RSSBus Connect gives users the flexibility to use only what you need. The flexible architecture and licensing of RSSBus Connect allows users to pick and choose the capabilities that matter most. Use RSSBus Connect for Managed File Transfer, or for EDI Integration, or both!